March | 2011 | Go Chapel Hill! Check out this video showing portions of the Bike Open Mike Night! On Saturday April 2, from 10 a.m-2p.m, Orange County Solid Waste Management is pleased to host a special re-use collection event to benefit local non-profits, in cooperation with the Triangle Reuse Alliance, at our administrative office! At the ReUse Rodeo residents can bring certain reusable materials to one location (1207 Eubanks Rd Chapel Hill) for the benefit of multiple local non-profits dedicated to reuse and waste reduction. The bus stop on Martin Luther King Jr. Boulevard at New Stateside Drive will be temporarily relocated beginning Wednesday, March 16, until further notice due to a tree trimming project. Passengers may board the NS and T buses at a temporary bus stop on Martin Luther King Jr. Blvd. about 200 feet north of the current location, just before New Stateside Drive. View a map at tinyurl.com/4kyfggc. For more information, call a customer service representative at 919-969-4900. On hand at a ceremony in University Mall this past Friday to celebrate Chapel Hill’s designation as a Bicycle Friendly Community by the League of American Bicyclists, Mayor Mark Kleinschmidt said peddling pedaling is an easier sell than peas and carrots. Remarks by the mayor, visiting Director of Bicycle Friendly America Bill Nesper, and Chapel Hill Transportation Management Coordinator Len Cone highlighted the ceremonies, culminating in the unveiling of a plaque commemorating the town’s latest distinction. 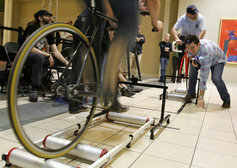 Public opinion was welcomed through a bike “Open Mike.” Goldsprints allowed stationary bike riders to compete in a timed race, and local businesses, including Performance Bicycle, The Bicycle Chain, and the ReCYCLEry were also on hand. Chapel Hill is not the first local community to catch the eye of the League of American Bicyclists, nor is it likely to be the last. In 2001, Carrboro was the first community in the State of North Carolina to be so-recognized. Initially awarded a bronze-level designation, Carrboro attained a silver designation in May, 2004. A 2005 Mobility Report Card revealed that bicycle activity increased 25 percent between 2003 and 2005 in Carrboro. UNC, already a 2010 Gold Award winner at the Best Workplace for Commuters “Race to Excellence” Virtual Awards Ceremony held in January, is also working toward designation as a Bicycle Friendly Community. Nesper said the Bike Friendly distinction is given to those earning a minimum number of points on a scale as indicated through a submitted application. There are currently 158 communities out of 400 applicants who have received the distinction in 43 states, he said, adding that the application questions are not solely relegated to commuting issues. “In bicycle friendly communities, that number is 70 percent,” he added. More importantly than numbers and policies, however, are tangible improvements where the mettle meets the pedals – changes bicyclists can see. Annie Martinie, community outreach coordinator for BeActive North Carolina, said cycling offers the benefits of a great workout, and is of even greater fitness value when used in combination with other types of training. Cone said the bronze Bike Friendly Community designation earned by Chapel Hill is just an entry point. One future development hinted at by town officials and bicycling enthusiasts is a local connector route with bicycle lanes to the American Tobacco Trail via Barbee Chapel, Stagecoach, and Massey Chapel Roads. Most importantly, however, the distinction is simply emblematic of one more feature that makes Chapel Hill a more attractive and healthier environment. Best of all, riding a bicycle may even be healthier than eating broccoli. And it’s a whole lot more fun.